Internet visionaries are worrying about the increased centralization of the Internet. They worry about centralization of power as most of the value on the Internet is flowing to four big companies that go by the acronym FANG (Facebook, Amazon, Netflix and Google). Apple isn’t on the list because they make money by selling good ol’ hardware. (Moreover, FAANG doesn’t sound so cool). Voices encouraging decentralization are strongest in Berlin, home to the majority of upcoming blockchain projects. Last week I was there attending the BlockStack Summit. If you go through my notes, you’ll know that almost all speakers believed how decentralization is the future of humanity. I disagree with that and here’s why. Youtube seems like the last place you’d go for lessons on decentralization. But it all becomes clear if you go back in history and see the first video uploaded on it. It’s Youtube’s cofounder’s friend describing how cool elephants are at a zoo. Does the video’s spirit remind you of the rawness of today’s decentralized projects? The bitcoin’s announcement in 2009 had a very similar, raw spirit. These projects started with the mission to give the power of creation back to the individual. Fast forward to today and if you see the top 50 channels on Youtube, 25% of them are backed by one central entity Vevo (while only six are self-owned). If 90% of top channels are backed and supported by one organization, I wouldn’t call Youtube succeeding in its mission of giving everyone a voice and show them the world. There’s a similar story of centralization for bitcoin. More than 50% of all bitcoin mining happens in four big groups. Youtube’ evolution from people posting funny cat videos to people consuming professionally produced videos is very similar to bitcoin’s evolution of a bunch of cyberpunks hosting mining nodes on their workstations to few companies making billions of dollars in profit from mining (while consuming electricity equivalent to many countries). 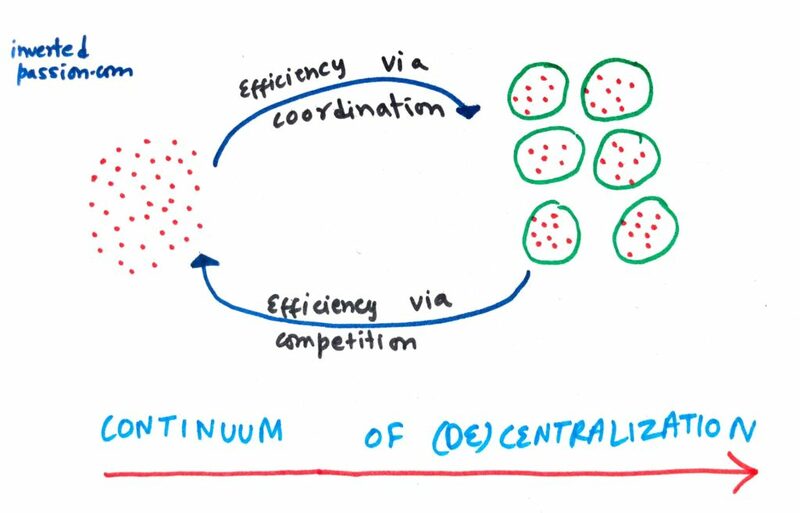 Centralization emerges from decentralization because participants seek efficiencies by combining resources and cutting waste. A good parallel to understand why centralization happens it to understand why companies exist at all. Ronald Coase used transaction costs to explain the existence of firms. His main argument was that there are transaction and coordination costs for production of products and services (like chips, videos, mined blocks) and centralization happens until these savings from coordination are greater than savings to be had from purchasing services in a competitive free market. As the failure of centralized planning in USSR demonstrated, extreme centralization is also inefficient. Markets are fantastic mechanisms to solve varied consumer problems and provide for their needs. Because centralization brings efficiency through coordination, firms are only good for solving one specific problem really well. To solve the multitude of problems and needs of consumers, we need multiple firms. That’s why neither every-man-for-himself type of decentralization, nor one-giant-company-for-all-needs is the solution to solving problems. The equilibrium is somewhere in the middle. There are things that are costly to achieve in free markets, for which doing them in-house is cheaper and more efficient. For example, if your requirement for legal services are recurring and always changing, you will be better off by hiring a lawyer full time for a fixed monthly salary than to negotiate project cost with law firm every week. If you hire them at hourly cost, you’ll be paying them more (vs hiring in-house). Similarly, as a customer with hundreds of choices in the decentralization world (say millions of cat videos), you wouldn’t want to spend your days searching for the best one. You want to identify good service providers quickly and that’s where trusted brands of centralized providers come into the picture. On the service provider side, there’s the psychological stress of unpredictable income (in a free market). So people join companies as a matter of insurance – they prefer predictable income from a pool of profits and not their individual but continuously-varying pot of profits. The inefficiencies that emerge in decentralized systems (where all free agents are pursuing their selfish motives) is called the price of anarchy. As you can see, decentralization-centralization is a continuum and not a binary choice. This means that in a free-market, systems migrate towards a point that creates maximum value for customers of that system. A system that starts with fully decentralized vision (bitcoin, Youtube) migrates towards centralization while a system that starts with fully centralized vision (USSR) migrates towards decentralization. The primary reason why we started building the new Blockstack internet is that a handful of companies consolidated too much power on the traditional internet. All this effort will be for nothing if any single company, including Blockstack PBC, ends up becoming a centralized power player in the ecosystem. This sounds good (and I support the sentiment) but market forces are blind to collective human values. Whether we want to admit or not, humans are short term, mostly selfish creatures. Unless a magical alignment in our collective human values occurs, I do not see an average Internet user choosing a decentralized service just because it’ll be good for everyone in the long run. People will choose decentralized services if they’re cheaper or more efficient. Otherwise, they will continue choosing centralized services because entities behind them are able to coordinate money, talent, and resources to provide great value for money. This is why Netflix is crushing Youtube is crushing Bittorrent. I’m not cynical and honestly think providing tools to humanity definitely does a lot of good for motivated humans. But we need to admit that most of us seek convenience and cost savings over collective human well being. Let me try applying the (de)centralization continuum and make a few predictions and observations. Extreme decentralization only makes sense for commodities and that’s why it won’t flourish. Complex needs that are hard to specify, and to service them, coordination is required. Centralized entities do all of that better. Decentralization is good for commodity services and utilities but profit margins for such commodity services are negligible. Why would anyone want to live on zero profit renting servers when they can start a data center company, employee people who are fed up with zero profits themselves and pursue coordinated efficiencies to make a profit for all of them. VCs are interested in funding decentralized services because they know decentralization is impossible Blockstack is funded because VCs know that most of the value will get captured by few centralized entities. Otherwise, why would VCs fund for commodity returns? It’s their job to give above-average returns and that don’t come from decentralized projects. Decentralized services will be adopted for solving specific crises/problems that centralized services cannot solve. Examples include things like anonymous file exchange (Tor project was the only solution for Snowden who had to send GBs of files to journalists anonymously). Centralized services are incapable of solving problems in this set but it’s a small set. Most human problems are wonderfully solved by centralized services. Decentralization is not inherently good or bad. Just like there’s good and bad sides to centralized services (Facebook/good = connect with friends, Facebook/bad = user tracking), there will be good and bad sides to decentralized services (Bitcoin/good = circumventing government capital controls, Bitcoin/bad = payments for murder). Centralization is usually hidden in decentralized systems. Because what goes into Linux kernel is an important question, Linus Torvalds as the Linux founder and its benevolent dictator takes that call. If core of a decentralized system is dependent on one person or a small group, it isn’t fully decentralized. Thanks Pranay and Nilesh for providing suggestions and early feedback.